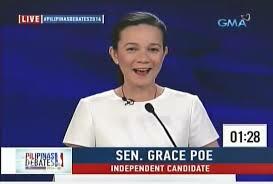 Grace Poe hugged the limelight when the Supreme Court of the Philippines sided with her that she is qualified to run as President of the Philippines and the questions regarding her residency is null and void. But before the groundbreaking decision was released, she was already very popular not only because she was an adopted child of the late great Fernando Poe Jr. who is touted as the King of Philippine Movies, but rumors surrounding her biological birth sent tongues wagging not only these days but long before Martial Law was implemented. It is insinuated that she is the daughter of the late President Marcos sired from Rosemarie Sonora, the sister of 60’s movie queen Susan Roces who happens to be the wife of Fernando Poe Jr.
With this background, people are naturally curious about her. Thus, she was elected as Senator of the republic by virtue of being the adopted daughter of The King of Philippine movies who was according to his fans was robbed of victory during the 2004 elections. The sorrow of it allegedly caused FPJ's untimely demise. 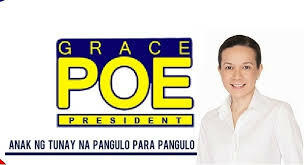 People really bought her idea of continuing the legacy of her adopted father despite the fact that her father was only an accidental politician and whose political experience was limited only to being chummy to many actors and actresses who ended up as politicians like former President Joseph Ejercito Estrada. It is also probably for this drama in her life that she is convinced, along with her supporters that she can lead the nation despite her lack of experience in the field of politics. And truly indeed, she charmed millions of Filipinos, if one believes in surveys. As of this writing, she already took the lead in surveys handled by the two leading firms although one of which is believed to be rigged in her favor due to personal relationships according to some netizens. However, as days towards the election date becomes nearer, her popularity is still something Mar Roxas can only dream of. 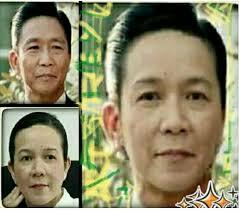 Thus, this creates the impression that Grace Poe really matters. Indeed, she gained new supporters and her loyalists remain steadfast on her probably due to the impressions she gained during the two presidential debates she participated. She was able to hold on to her candle by creating an image that she is the most qualified and prepared candidate by virtue of her intelligent and confident responses during the two debates. Other candidates have debate performances wanting in substance. For example, Mayor Duterte’s responses were amusing but some of his responses were either verbose or off tangent. Mar Roxas presented very good ideas but ironically people found his ideas insincere and questioned why he was not able to implement some of the ideas when he has the time and resources. Vice President Binay on the other hand is suffering from an image problem due to corruption issues; thus, no matter how excellent his ideas are, people will definitely not buy him. With regards to Miriam, people saw her performance as merely a caricature of herself and is a form of entertainment to supporters of Duterte, Binay, and Roxas. Her travails in politics are stuff Philippine TV is made of. Her story are full of twists and turns that will put to shame some of the plots of popular “teleserye” shows. Thus, she matters to millions of Filipinos as they want to know how her struggle to become the President of the Philippines will end up. Some may probably want to participate too by giving her the required votes and brag later on that he or she gave Grace Poe the winning votes. Her victory will inspire foundlings like her to pursue their own dreams. Her dubious victory with regards to citizenship gave new meaning on who are natural born Filipinos are and encourage Pinoys in many parts of the world to pack up their bags and go back to the Philippines to run for any political office. President Aquino was elected as president not only because of the death of his mother but he was perceived to be a good alternative to succeed then President Arroyo. 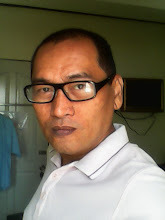 At that time, Filipinos wanted change and millions of Filipinos were convinced that Noynoy is the man to bring the change by virtue of his “Daang Matuwid” sloganeering. While many Filipinos smirked at this concept, still a lot are convinced that in some way or another, President Aquino was able to implement his ideals. The most glaring example is the imprisonment of President Arroyo and the impeachment of Supreme Court Chief Justice Renato Corona. Indeed, there are huge numbers of Filipinos who are convinced that one should perpetuate “Daang Matuwid” and by electing a non-traditional politician (trapo), it will be realized. Senator Grace Poe presented herself as non-trapo even though some of her moves say otherwise (some even calls her TraPoe). The drama surrounding her personal and political life clouded Filipinos' intellect and instead sympathized with her instead of being critical of her actions. She presented herself as feisty in character when she declared to run as president of the country. Some described her move as a sign of her being power hungry, but to her and her supporters it is destiny. One has to remember the drama involved with Philippine politics; Marcos vs. Aquino, the failed presidency of Fernando Poe Jr, the failure of Erap Para Sa Mahirap, the deceit and betrayal of President Arroyo, and the son also rises plot of Benigno Aquino. 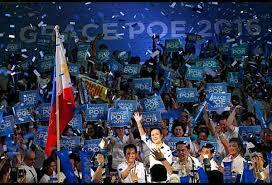 It won’t be a surprise to millions of Filipinos if Grace Poe will win the election; Filipinos just love drama.